Walking out of the sold-out Friday night screening of The Tree of Life felt a bit disconcerting. For nearly 2 1/2 hours an entire auditorium of strangers, my wife, and I sat raptly as we eavesdropped into one man's soul, as facilitated by director Terrence Malick. Though its central character is the adult Jack O'Brien, the actor who portrays him, Sean Penn, appears onscreen for, maybe, no more than a quarter of an hour. That is because, as with many of us, O'Brien dwells on the formative events of his youth. So instead, it is Brad Pitt and Jessica Chastain, as Jack's parents, and Hunter McCracken, as Young Jack, who carry us through most of the film. Told in stream-of-consciousness, The Tree of Life unfolds at a deliberate pace on a large–some might say cosmically so–canvas, so that by the film's conclusion one feels as if one has lived an entire lifetime during the film's relatively short time-span. This is not a criticism. The Tree of Life is the apotheosis of many themes Malick has explored in his previous films, so it is no surprise that it evokes each of them at different points in the movie. Like with Badlands's Holly(Sissy Spacek), Jack wrestles with his capacity for evil. As with Days of Heaven's Linda (Linda Manz), Jack contemplates the unfathomable influence that the world exerts on both his parents' relationships to each other and to him. Jack contemplates his own meager effect on the larger skyscraper-laden world around him the same way The Thin Red Line's Sgt. Welsh (also played by Penn) cynically questioned his squad's fatal importance to the outcome of a seemingly pointless battle in the Pacific. Finally, like John Smith (Colin Farrell) in The New World, Jack considers if the loss of innocence that is built into humanity's search for answers is truly a worthy sacrifice. 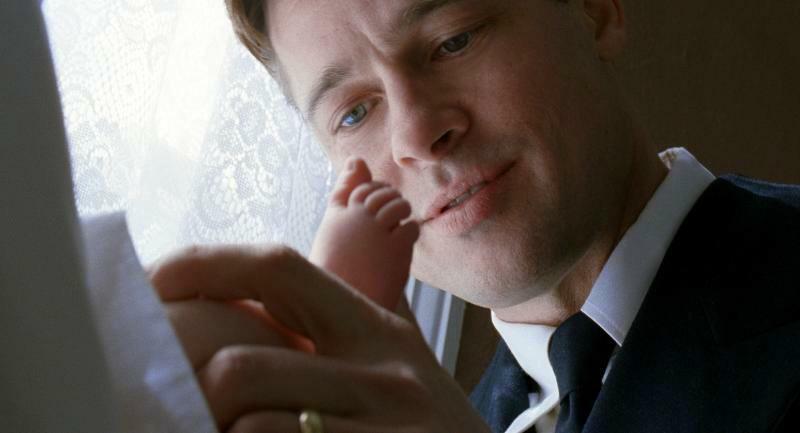 Pitt will be considered at the end of the year for his pivotal role as Jack's father. Mr. O'Brien is a stern taskmaster who bullies his three boys into adulthood. In moments of despair, such as when he loses his job or after the death of his son, he regrets his inability to be forthright with his sons about how much he loves them. As Jack's mother, Chastain embodies the nurturing spirit which teaches the boys to dwell in the moment and appreciate the fleeting mysteries which unpredictably make appearances in our lives. "Brother. Mother," Jack says at one point in the film. "It was they that lead me to your door." Penn's Jack is afflicted with the same spiritual crisis many of us face as mortality grows into an inescapable reality. He wonders what his place is in the universe, among society both in this plane and in the next, even his place in his own family. He seeks answers he can only get from a higher power, one whose existence he has often doubted. The strong performances of McCracken (a virtual clone of Penn) and Laramie Eppler (nearly identical to Pitt)–who plays his younger brother, R.L.–prove that Malick still has the same talent for casting child actors as he did when he discovered Linda Manz for Days of Heaven (1978). R.L. 's resemblance to their dad is significant, encouraging one to think of what the stern Mr. O'Brien may have been like as an innocent youth. It also informs the scenes in which each family member reacts to his offscreen death (later in life, but earlier in the film's chronology), his sudden demise signaling Mr. O'Brien's total disconnect from the child within. As Mrs. O'Brien wrenchingly cries, "I want to die so I can be with him again," her husband shoos comforting neighbors away through clenched teeth, "We'll be alright." Finally, R.L. 's looks underscore how Young Jack doesn't look like either of his parents. Jack's interior monologue, the narration which ties all of these non-linear recollections together, confirms that though he acknowledges each of his parents' contributions to forming the man he will become, like most of us, he often speculates whether he is really the offspring of either of them. How many directors can lay claim to such a creatively boundless body of work with such a scanty filmography? This is only Malick's fifth film since 1973, but it is the culmination of an odyssey in which the director has worked to mount The Tree of Life in one form or another for over 30 years. And the result is a motion picture that is somehow both intimate and epic, a magnum opus that is still personal in its small-scale look at a family living in 1950s Texas (where Malick grew up). The first half-hour of the film may try the average multiplex attendee's patience as the movie shifts between the creation and development of the universe (the literal Big Bang), and present-day Dallas, where a spiritually empty Jack meditates on his brother R.L. 's death years ago, at the age of 19. Yes, as rumored, dinosaurs do make a cameo in the film during this short stretch. But there is no hokeyness or pretense to Malick's application of cosmic metaphor to the personal travails of one small man. The effect is just the opposite, an intentional distancing of the viewer from the involving, even touching, events of Jack's life he is about to see unfold. Malick is both addressing the broad universality of the events depicted in this one man's life and affirming that they are as important in the grand scheme of things as a grain of sand would be to the continuing story of our own world. There is something both distressing and comforting in that. For my thoughts on the rest of Terrence Malick's films and how they offer perspective on his views of the American experience read "Terrence Malick's Americana," the latest of my weekly columns for Nomad Editions: Wide Screen. Great review, Tony. I was bowled over by this film in all the ways I didn't expect to be. I didn't expect to see myself in some frolicking hellraiser from the '50s and certainly not in the awe-inspiring yet scientific progression of existence, but at every moment I felt this film, and it makes it all the harder to see where people who view it as some clinical exercise are coming from. There were moments so true to life it was hard to keep looking at the screen for seeing my own reflection, but it also had a scope far beyond anything I've ever seen. I simply can't talk about this film without gushing. I don't think I've ever felt this way specifically about a film before. When I get back from the gym, I'm going over to your site to read your review, Jake. Sounds like you enjoyed it even more than I did. Personally, I'm hoping the DVD Extended Edition will restore some other universal scenes from childhood, like Jack's parents losing it when Jack and his brotheres can't behave at a family restaurant. Saw this movie today and of course, checked out your review just after returning home. I enjoyed your review, but we differ wildly on this film. I'm sorry to say that, as I am a huge fan of Malick and was so looking forward to this film. Yes, the visuals are stunning - given the talents of Malick and cinematographer Emanuel Lubeszki, that is to be expected (yet still amazing even for them) and I actually was enthralled by the first half-hour. But this was a pretentious film for me. I actually couldn't wait for it to end. Yes, I expected to be challenged and some scenes (such as Pitt playing the organ in church for his son) were wonderful, but this just didn't capture me, as it seemed deliberately confusing and slightly strained. Where is the Malick I loved in Days of Heaven? Tom, the "pretentious" label is one I find particularly irksome in regards to this movie. As Jake, my commenter above said elsewhere, I believe this is Malick at his most sincere. There is no pretense about this film. I think it is a difficult film, and it certainly isn't my favorite Malick film right now. But I almost take it as a given that I must see his films a second time to fully apprehend them. As critic Omar Moore put it, the first viewing is necessary almost to simply just dispel one's preconceptions of the film. I'd be interested to see if a second viewing moves you differently. I certainly entertained thoughts of seeing this film a second time. Hopefully, I'll get that chance soon. For me, this story may have seemed clear in Malick's head, but it wasn't that lucid on the screen. This is unlike his other films, especially Days of Heaven or The Thin Red Line. Kubrick's 2001: A Space Odyssey seems rather straightforward by comparison. That said, we certainly need a visionary such as Malick in our industry. Very few directors cling to such a personal vision as shown in his work, so for that reason alone, the film is a must-see, whether one likes it - or understands it - or not.